WABCO (NYSE: WBC) is a leading global supplier of technologies and services that improve the safety, efficiency and connectivity of commercial vehicles. Founded nearly 150 years ago, WABCO continues to pioneer breakthrough innovations for advanced driver assistance, braking, stability control, suspension, transmission automation and aerodynamics. 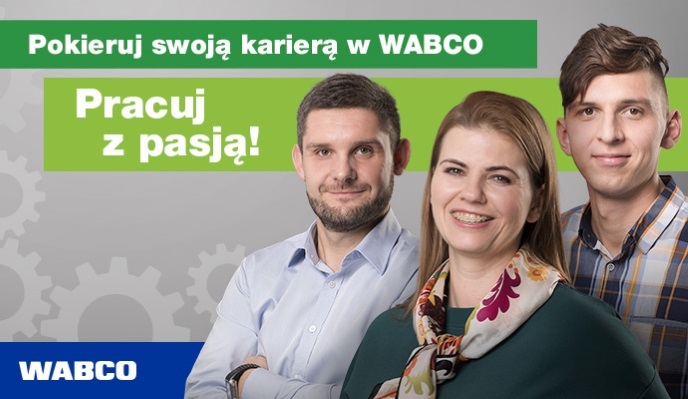 Since 1999 WABCO successfully operates in Wroclaw, Poland, currently employing approx. 3000 employees in two manufacturing sites, remanufacturing site in Stanowice and R&D Center. Our employees support business processes, integrated supply chain and global finance center. For more information, visit www.wabco-auto.com.